The establishment of strong democratic institutions and processes in Sudan will be a key prerequisite for peace in Darfur and the South. By setting forth a timetable for elections, the 2005 Comprehensive Peace Agreement seeks to give Sudanese citizens significantly more control in how their country is governed. However, the CPA election clock is ticking and neither the institutional foundations nor the requisite electoral processes are in place. These electoral processes in the context of the implementation of the CPA provide Sudan’s best hope for peace—a political transformation through democracy. Sudan has been torn apart by internal conflict for most of its independence, in part because of the lack of democratic processes or institutions. Resolving Sudan’s ongoing conflicts and preventing future violence means seizing the opportunity provided by the CPA to start building these foundations. The international community must demand full and timely implementation of the CPA—particularly these electoral provisions—and deploy additional personnel and resources now to ensure that this historic opportunity is not missed. As well, donors must provide significant support to civil society organizations in the North and South and to Southern Sudanese government institutions to strengthen the forces promoting democracy in Sudan. There should be penalties for non-compliance with the CPA timetable. The U.N. Security Council endorsed the CPA and key Security Council members helped negotiate it. But much more could be done to ensure that the CPA’s provisions have not been violated repeatedly by the National Congress Party (NCP). The Security Council should consider targeted sanctions against those officials who are most responsible for obstructing the implementation of the CPA. If the Council will not act, the United States and the European Union should consider appropriate, coordinated responses, and encourage the African Union and Arab League to join in demanding implementation of this critical peace deal. A new, national census is directly linked to the 2009 elections in two key ways. First, the CPA states that representation of the North and South at the national level will be based on the population ratio. The power sharing percentages currently stipulated by the CPA shall be “confirmed or adjusted on the basis of the census results.”  Currently, the ruling NCP has 52 percent of the seats in the National Assembly, the Sudan People’s Liberation Movement (SPLM) 28 percent, and other political parties 20 percent. The NCP and the SPLM negotiated these percentages during the drafting of the CPA, but without new, valid census data, it is not possible to confirm that these percentages accurately reflect Sudan’s current demography. The census results will also provide the basis for determining constituencies and for voter registration. The ruling NCP has a keen understanding of the critical relationship between the census and the fairness of the 2009 elections, and has attempted to derail the census. The CPA mandated that the census be undertaken by July 2007 in order to allow sufficient time to collect, process, and analyze the data before the election. Because of funding delays by the NCP, however, the census date slipped from July 2007 to November 2007, then to February 2008, and has most recently been rescheduled for April 2008. If the date slips yet again, the rainy season will prevent the census team from gaining full access to Southern Sudan and tip the balance toward the North. The NCP tried to make unilateral changes to the census questionnaire that would have thwarted the ability to count the Southerners who live in Northern Sudan. This was important because the war was waged in the South and the majority of Sudan’s displaced citizens are Southerners, and between two and four million now reside in the North. The South/SPLM had to push hard to ensure that the census questionnaire would accurately determine the number of Northerners and Southerners throughout the entire country. This will ensure that there is a way to determine the precise number of Southerners who reside in the North and the precise number of Northerners who reside in the South. The international community can help to ensure that the census—now scheduled from April 15-30, 2008—is successful first and foremost by providing sufficient numbers of qualified international observers of the census. The election has the potential to reshape the distribution of political power at all levels of governance in Sudan. Elections are mandated to take place at six levels of government: the Presidency of the Government of National Unity, the Presidency of the Government of Southern Sudan, the National Assembly in Khartoum, the Southern Sudan Legislative Assembly in Juba, 25 State Legislatures, and 25 State Governors. The immediate requirement for a sound election is for the National Assembly to pass an election law that meets international standards. Without the passage of a new law, the National Electoral Commission cannot be established and extensive preparations needed for elections cannot begin. These preparations include: selection and training of election commission staff; voter registration; construction of electoral commission buildings in the South and identification of buildings in the North (one in each state capital); procurement and distribution of ballots (the number will depend on the type of electoral system), ballot boxes, voters rolls, and vehicles; training and recruitment of domestic and international election observers and polling agents; and massive voter education campaigns. Sudan’s Election Bill was scheduled to be passed by the National Assembly by December 2007, but the Assembly failed to do so. Even the best case scenario presents major challenges. If the law is passed in January 2008, the electoral commission established in February, and the election scheduled between March 2009 and July 2009, the commission will only have one year to accomplish the myriad tasks listed above. There are two further practical issues: dates and costs. Although the CPA allows for elections to take place as late as July 9, 2009, it is critical that elections be held before the onset of the rainy season in order to ensure that all Sudanese are able to vote. Conducting a complex election in Africa’s largest country with one of the most underdeveloped infrastructure systems on the continent will pose a massive and expensive logistical challenge. Assuming that half of the estimated 38 million Sudanese will be of voting age in 2009, the United Nations estimates that the election will cost between $400 and $500 million. The 2006 elections in the Democratic Republic of Congo demonstrate that, with requisite resources and will, large underdeveloped countries can hold successful elections. The premise of the CPA is that during the six years between the signing of the agreement in 2005 and the self-determination referendum in 2011, the NCP, SPLM, and the agreement’s international guarantors and supporters work to “make unity attractive,” thereby increasing the likelihood that Southerners would vote for unity. However, given that the war was fought principally in the South and Southerners were the primary victims of a conflict that killed 2 million people, the burden to make unity attractive rests overwhelmingly with the NCP in Khartoum. The clock is ticking, and the NCP must soon demonstrate a real commitment to unity. At this juncture, the chances for a vote for unity are remote. First, throughout the war, the desire for independence grew in direct proportion to the amount of force used against the South – and the war was sufficiently violent, and government forces were sufficiently unrelenting, so a significant portion of the Southern Sudanese people decided that independence was the only option. Second, John Garang – who had the credibility to champion the cause of unity in the South because he had the power to press unity upon the North – is no longer on the scene. And third, Khartoum has not only failed to make unity appear attractive, it has taken steps that signal genuine unity is impossible – by thwarting the implementation of the CPA, by its actions in Darfur, by its handling of oil resources, by its rejection of the Abyei Boundaries Commission’s findings, etc. Looking at other post-conflict or post-dictatorship situations, not only in Africa but also in Latin America and even in Iraq, the credibility of peace and democracy derives from two things. First, credible institutions that work; i.e., that enable people to resolve their differences and determine their political futures. And second, tangible economic dividends; i.e., real change in the standard of living, in wealth distribution, etc. Those economic dividends will result from the degree to which the NCP shares the wealth of the country and the commitment of the Government of Southern Sudan to transparent governance. And the credibility of the census, the election, and the referendum — if carried out openly, transparently, and honestly — will demonstrate whether the NCP is committed to a truly united Sudan based on equality and respect. Thus far, the NCP has not demonstrated that commitment. It will be up to the citizens of Southern Sudan to cast their vote in the referendum on whether unity has been made attractive. Those votes will create a new Sudan—in either one or two parts—that will be born of the people, by the people, and for the people. Therein lies the power — and the promise — of the CPA. Whether this promise is realized depends in large part on the international community’s support for the census, the election, and the self-determination referendum. 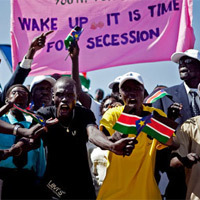 Abyei will have a separate self-determination referendum at the same time the South has its referendum. The ENOUGH Project will discuss the Abyei issue in a forthcoming report. The CPA mandates international observation of the election, and citizens both North and South are aware of this provision and embrace it.